From the runways of the past to the mega fashion shows of tomorrow. 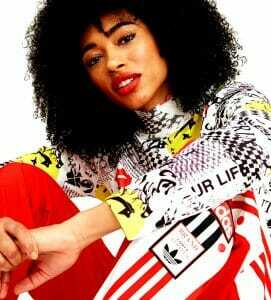 The modern fashion consumer seeks more than fashion products but entertainment. They seek new ways to stir their emotions, achieve a sense of engagement and participation in the brand’s journey. The origin of the catwalks begins in the late 1800s. Started as private events assorted with canapés and tea, these home-bound parties were designed with the aim of presenting and marketing the couturier’s latest creations to a handful of wealthy clients. There was little accent put on the surrounding settings and more on the glamorous and extravagant garments, as worn by women seeking to be noticed by the media. There were no smartphones, social media, or Kardashians flooding the internet with catwalk pictures; just hand-picked fashion editors and industry insiders. However, the 60s rise in mass-consumerism and ‘ready-to-wear’ fashion coupled with an accelerated decline in the demand for haute couture, transformed the once-traditional parties into fashion parades. 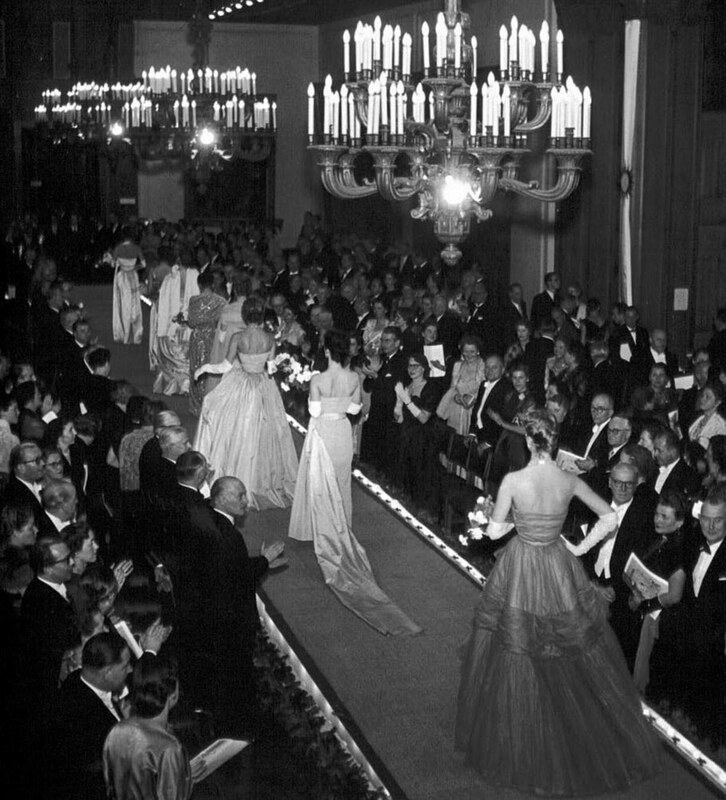 Discreet catwalks were replaced by larger fashion shows organised by high-end department stores as a new way to elevate their reputation. Hosted in unusual locations, with models free-flowing on the sounds of ‘energetic’ musical styles, these shows had the number of participants on the rise and yet exclusively selected, from the industry’s most recognised buyers, retailers, and journalists. The modern fashion shows as we know them nowadays have arguably started with McQueen’s 1998 show. ‘Fire and blood’ advanced the classic catwalk shows to theatrical masterpieces which were slowly blurring the lines between fashion, luxury, and art. Over the past few years, with the help of technology, new presentations were set up as novel ways for fashion brands to honour their past, celebrate the present, and unveil their future. However, not only the fashion brands benefited from the constant technological developments. The 21st century has given anyone with an internet connection the power to get a glimpse of the styles coming out next season, before they hit the glossy printed magazines, and experience the show almost like being there – front row seat. As such, unlike the runways of the past which put the focus on garments, modern mega fashion shows began to prioritise the audience’s senses and emotions by engaging and interlacing them with the intangible construct of who we feel we are. The runways of the past have become tech-infused experiential shows as sources of emotions; modern battlefields of fashion brands divesting traditions to take on and showcase innovations. 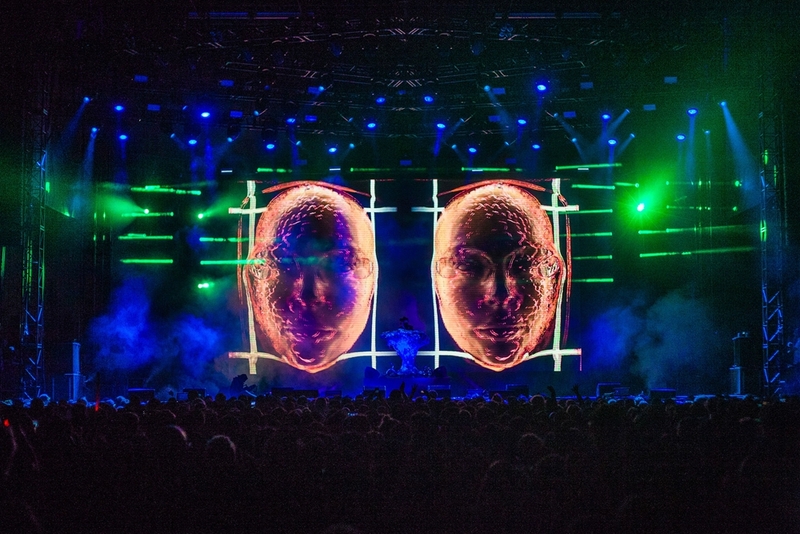 Shows and patchworks of colours, music, virtuality and digital identities, beautifully constructed to immerse the audiences into cinematographic-like, imaginary worlds. Bringing bold and disruptive ideas on the stages of the mega fashion shows has become more than a trend but a necessity for the brands’ survival. 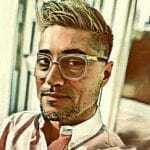 Survival in today’s connected world. Technology gives the fashion brands the power to showcase their ability to experiment, innovate, and digitise while telling the story of the brand in a more digestible format. Also, live streaming and social media have become critical tools in allowing the audience co-create by constructing and sharing their own concepts of the events with the fashion world. In the age of smartphones and social media, there are no catwalk front rows without Pharrell, Gigi Hadid, Cara Delevingne, or Kendall Jenner. Modern mega fashion shows feed on the mediatic power of fashion influencers as a requisite in ‘defining’ their quality and worthiness for consumption. The internet has given birth to a new era of fashion shows, live broadcasted, insanely cinematic, and filled with visual – emotional experiences. 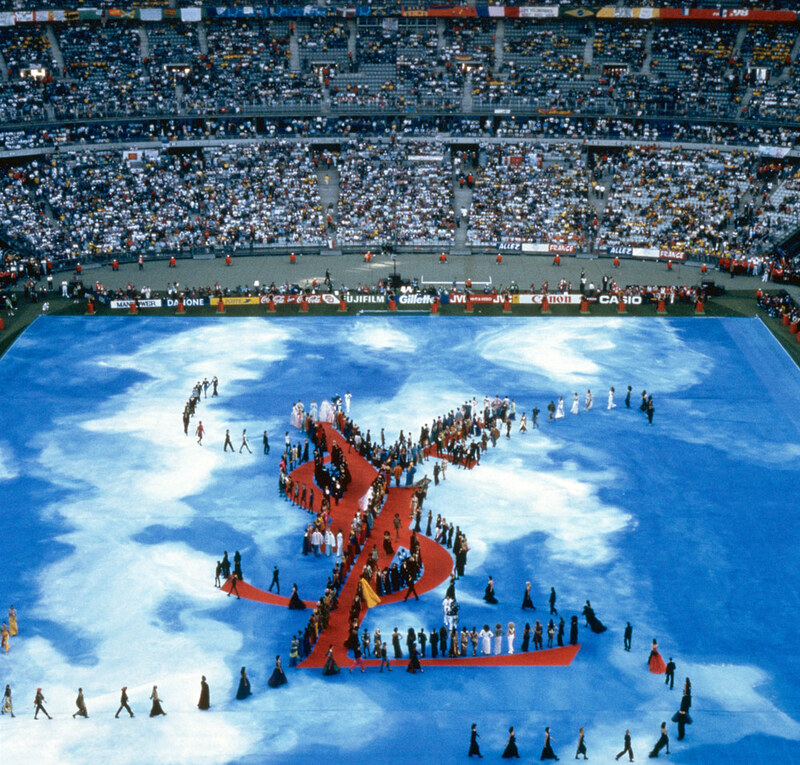 In one of the earliest events signalling what’s coming, Yves Saint Laurent’s 1998 World Cup Final fashion show took over Stade de France for fifteen minutes of magic. There were 300 models – backed up by a team of 200 technicians, 130 dressers, and 70 makeup artists – performing for the 80,000 spectators present in the stadium, and a live audience of one billion television viewers from all over the world. YSL mega fashion show approach was quickly followed by Lagerfeld’s 2007 one year-long installation costing in excess of $10m. 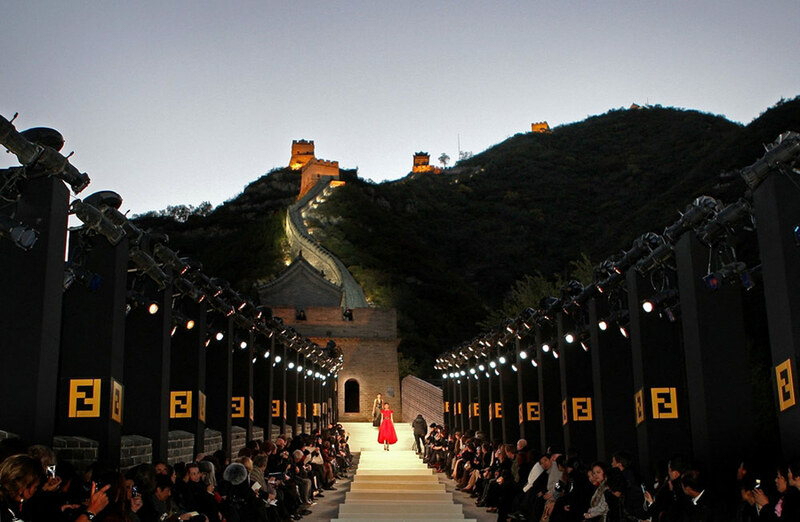 The German designer took over the 2,000-year-old, iconic Great Wall of China and turned it into the world’s longest runway ever made. Visible from space, the breathtaking show of strobe lights and gigantic Fendi logos projected onto the mountains, and accompanied by a rare audience of 500 VIPs, was an absolute hit. There can’t be a top of mega fashion shows without including Pierre Cardin’s 2007 unique runway show. 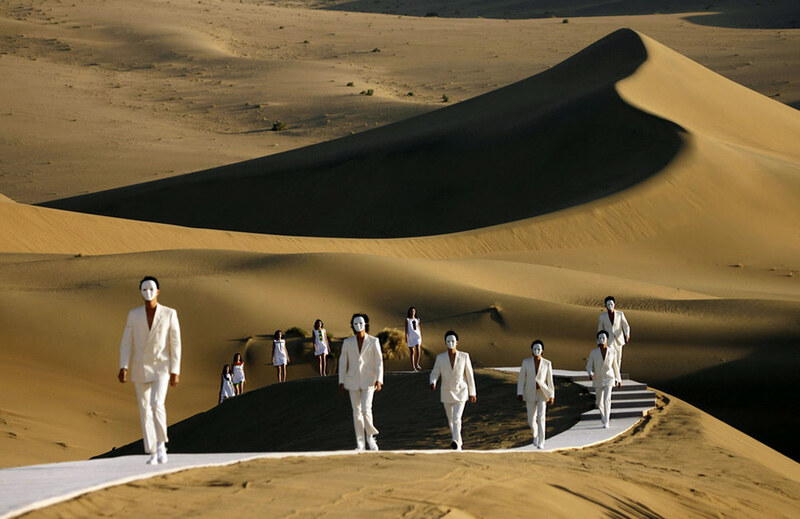 Organised on the whistling sand-mountains of Dunhuang and along the dunes of the Mingsha Shan mountain desert, Cardin’s catwalk was a direct suggestion to Marco Polo’s travels to China over seven centuries ago. Set up on the iconic Silk Road, the trade route which connected textiles merchants from Europe with Asia, Cardin’s models paraded over two hundred mesmerising silk creations, in the front of over 200,000 selected guests. Nevertheless, in the creation of the most extravagant ever fashion shows, Chanel remains the indubitable winner. The brand’s 2017 installation turned Grand Palais into a space station hosting a Chanel-branded rocket that eventually took off. It was more than a mega fashion show packed with sensorial experiences aimed at rewiring consumers’ expectations but the brand’s symbolic showcasing of what’s coming, after a whopping $1.46 billion spent on marketing that year. As we decipher more of how evolution has shaped our biological and psychological construct, it seems that human behaviour is partly rooted in the needs for status and to belong and driven by emotions such as excitement and pride. Despite the never-ending changes in the surrounding ecosystem, as modelled by the fast technological advancements, emotions remain at the heart of our daily decisions. Take for example Kanye West’s 2016 fashion show at Madison Square Garden. 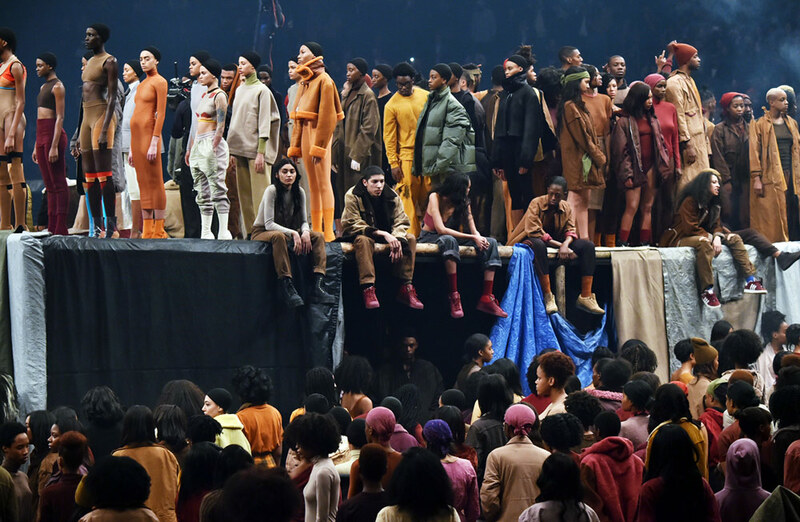 Organised in collaboration with Vanessa Beecroft, an Italian contemporary artist, Kanye’s show was constructed around the fashion’s relationship with the music industry as inspired by the rave culture and subcultures of the ’80s. The show was orchestrated as a contemporary reinterpretation of classical times, supremely choreographed, and even bestowed by Naomi Campbell’s appearance on the runway. In his profoundly emotional event, Kanye drew inspiration from the 2015 Super Bowl XLIX event which had Katy Perry, Lenny Kravitz and Missy Elliott as guests, and streamed live on YouTube, attracting a ‘halftime’ audience of 114.4 million views. It was the largest audience in the history of the Super Bowl, which won the organisers two Emmy Awards that same year for the most watched TV shows ever in the US. 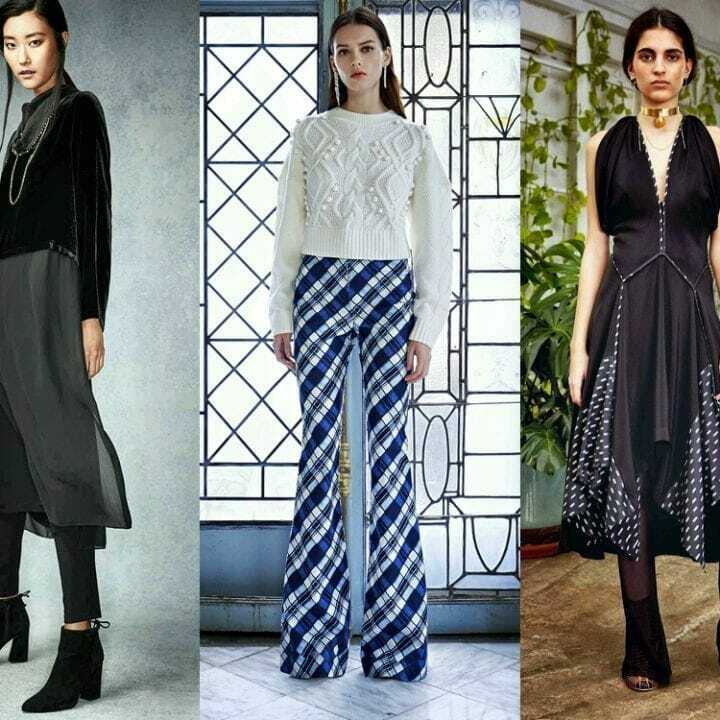 Mega Fashion Shows – What’s Next? The combination of fashion with music and innovative technology has led to the emergence of a new breed of co-creational fashion shows. 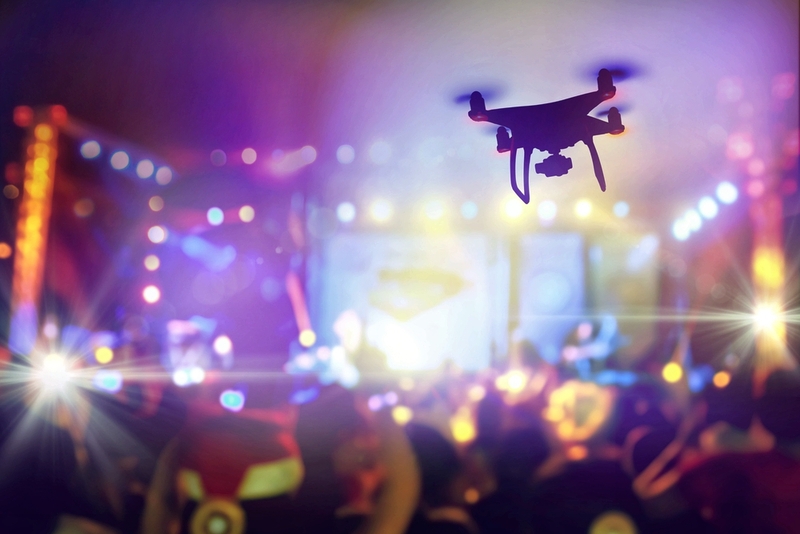 Broadcasted in real time to global audiences of followers, modern mega fashion shows employ singers, dancers, on-stage artists, models, and performers, surrounded by autonomous laser-bearing drones, pre-synchronised with music and supported by the audiences’ power of impact, positive or negative, as depicted on social media. Used as integrated communication devices by the fashion brands, modern mega fashion shows have become arguably the most appealing forms of entertainment, able to leverage endless cultural backgrounds and tribal affiliations through emotional and technological extravagance, while ultimately showcasing the brands’ DNA.